(g) No estimate may include the use of a non-original equipment manufacturer aftermarket crash parts unless authorized by the customer in writing. (h) The estimate shall include the use of repair specifications by the original equipment manufacturer for those parts, and no repair facility or installer may use repair specifications or procedures that are not in compliance with the original equipment manufacturer for those parts unless authorized by the customer in writing. Obtaining signed consent might not in general absolve a repairer of liability for doing something unsafe, attorneys Erica Eversman and Todd Tracy have pointed out. We asked Eversman (Vehicle Information Services) Friday if a Legislature’s description of deviating from OEM procedures or parts with customer consent implied the state felt the shop had no liability for the consequences of that work. “I suspect these types of provisions are not intended to push off the responsibility for knowing the type of parts/procedures to be performed in the repair to the customer,” Eversman wrote. “Rather, I think this is an attempt to require shops (and also insurers) to make certain they are having the necessary conversations with customers about what deviating from OEM parts and procedures means to them. (e) Procedures. No repair facility or installer may use repair specifications or procedures that are not in compliance with the original equipment manufacturer for those parts unless authorized by the customer in writing. Presumably, the idea is that repair procedures should be followed for all parts, not just aftermarket ones. HB 4926 was sent to the House Rules Committee on Wednesday. A similar bill in the Senate does not appear to exist. Illinois estimates are already required to identify each part as “new parts, used parts, rebuilt or reconditioned parts, or aftermarket.” The new law would only demand the new written consent for aftermarket parts, a win for automotive recyclers and remanufacturers. That distinction is an issue this legislative season in West Virginia, where a bill seeks to bar the use of anything other than new OEM parts on a vehicle’s first three years. Four years ago, the West Virginia Supreme Court of Appeals said that using recycled or salvage OEM parts without notification did not violate the Automotive Crash Parts Act. The law requires collision repair shops and insurers to tell customers if they’re using anything other than “genuine crash parts” and get their consent in writing to do so. The court ruled in 2014 that the Legislature had worded the law to apply only to aftermarket parts; had it intended used parts notification (recycled parts are “genunine” OEM, after all, even if they’re used), it would have said so. West Virginia Senate Bill 308 the changes the language to clarify that shops must “use genuine new original equipment parts,” no exceptions, on insurer-paid work for 3-year-old or younger cars. 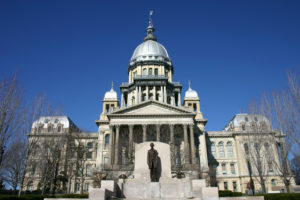 Be heard: Illinois legislator contact information can be found here and here.